Here’s a sure-fire way to get gouged: Walk onto a car lot, ask a salesperson to point out the vehicle with the smoothest ride, then purchase that vehicle regardless of price. It sounds reckless, but this is not far from the logic individual investors are using when shopping for the smoothest ride in the stock market. You are not alone if you have been searching for ways to get exposure to stocks via low-volatility investment strategies. A recent survey by BlackRock suggests that market volatility is one of the most popular topics clients bring up with their advisers. Low-volatility stocks appear to provide an answer to individual investors’ concerns with empirical support showing that they tend to outperform the broader market, on average, over time. As a result, investors have been piling into them. According to Research Affiliates, the total assets invested in low-volatility strategies have ballooned from $8.65 billion in 2010 to $58.47 billion in 2013. But appearances can be deceiving. Large inflows of capital into a narrow sliver of the market should alarm any value-conscious investor. To this point, research from Richard Bernstein Advisors illustrates that the lowest-beta stocks (stocks with the lowest sensitivity to overall market volatility) are trading at lofty valuation levels. Sources: Richard Bernstein Advisors LLC., BofAML US Quantitative Strategy. Not only are the lowest-beta stocks expensive relative to the market, but they also trade at a valuation premium to high-beta stocks (stocks with the highest sensitivity to overall market volatility), which is uncommon in the US market. A paper published in December 2013 titled “Low-Volatility Cycles: The Influence of Valuation and Momentum on Low-Volatility Portfolios” offers some unique insights into low-volatility investing and explores how today’s lofty valuations could affect the relative performance of low-volatility investing strategies going forward. Using 44 years of data (1968–2012), researchers sorted the largest one-third of US stocks monthly into five groups, lowest to highest, based on beta—a widely accepted measure of a stock’s sensitivity to market volatility. They then analyzed the returns, valuations, and momentum characteristics of the five groups over time. A Low- or High-Volatility Anomaly? An important finding from the study suggests that you do not have to invest in a concentrated portfolio of the least-volatile stocks to benefit from the so-called low-volatility anomaly. 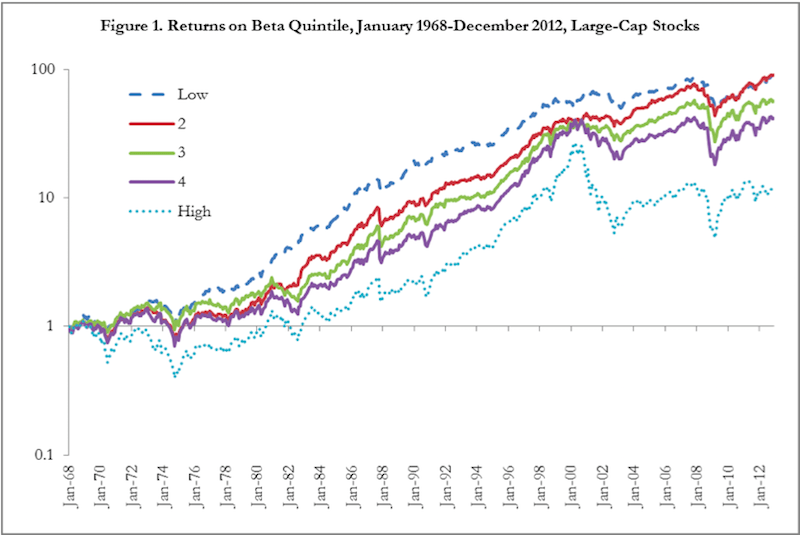 The chart below, which was taken from the study, illustrates that although beta rose significantly for each of the three lowest-beta groups, the average returns of those groups were fairly similar. Average returns dropped considerably only within the highest-beta group, which demonstrated abnormally poor relative returns over the study period. Source: Low-Volatility Cycles: The Influence of Valuation and Momentum on Low-Volatility Portfolios, page 25. This finding implies that investors holding the lowest-beta stocks would have significantly outperformed the market because they would have avoided exposure to the highest-beta stocks, and not necessarily because the lowest-beta group of stocks performed significantly better than all of the other groups. Investors should heed this research when selecting investment products. Many “low-volatility” funds are restricted to an investment universe of the least-volatile quintile of stocks in a broader market index. For example, an S&P 500 Low-Volatility ETF might hold only the least-volatile 100 stocks in the S&P 500 Index. As illustrated above, restricting your investment portfolio to such a small universe of stocks is probably not necessary if you are in pursuit of the lower volatility and higher returns associated with the low-volatility anomaly. Going too narrow with regard to your investment universe could also lead to high concentrations in specific sectors or, if the fund invests in a small universe, stocks. Most of the research regarding low-volatility stocks has focused on simply grouping stocks by some measure of volatility and analyzing their returns over time. But this particular study also examined the relative valuation and momentum characteristics of the volatility-based stock groups. Results from this extra layer of analysis illustrate that the excess returns associated with low-volatility investing strategies are strikingly cyclical. The researchers argue that this cyclicality is driven mostly by changes in the relative valuations, measured by price-to-book ratios, of low-volatility versus high-volatility stocks and investors’ overall appetite for momentum investing. To this point, they found that a portfolio of the lowest-beta stocks failed to outperform a portfolio of the highest-beta stocks when those lowest-beta stocks began the period trading at a valuation premium. 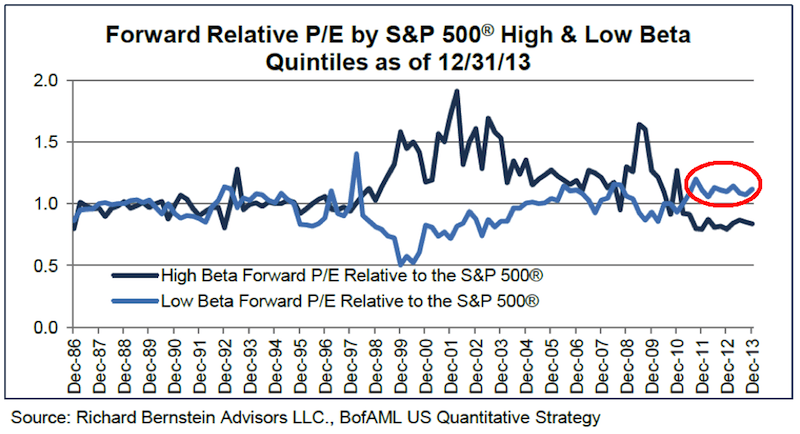 As expected, the study concluded that at the end of 2012, the valuation levels of the lowest-beta stocks were close to historical highs relative to the highest-beta stocks. In addition, the lowest-beta stocks had high exposure to momentum. According to the authors, these two factors combined were an indication that the future for low-volatility investing strategies had become increasingly uncertain. The notion that valuation matters should give caution to investors today because the valuation levels of the lowest-beta stocks still look lofty relative to the highest-beta stocks, albeit using a different valuation metric (e.g., forward price-to-earnings ratios). First and foremost, try not to obsess over minimizing the daily price fluctuations of your investment portfolio to the point you turn a blind eye to other issues, such as valuation and liquidity. Instead, focus your thoughts and conversations on the volatility of stock returns over your specific time horizon, which is likely much longer than days or months. Short-term bouts of volatility will always be a part of investing in a diverse portfolio of stocks. This not a bad thing because it can create opportunities for patient investors. Second, diversify if you have heavy exposure to low-volatility stocks, but do not abandon them completely. The low-volatility stock trade seems long in the tooth, but no one knows for certain what the future holds for low-volatility investing. Keep in mind that lowering your exposure to generic low-volatility strategies does not necessarily mean you have to dramatically increase the overall volatility of your investment portfolio. Consider diversifying among geographies and different factors, such as value and market capitalization. In conclusion, just because an investment has delivered higher returns and a smoother ride in the past does not mean it will do the same in the future. The apparent cyclicality of low-volatility investment strategies supports the notion that they are no silver bullet. Going forward, investors in the market’s least-volatile sectors and stocks should tread lightly, remembering that short-term market volatility is not the only risk out there and that the price paid matters.